Is there anything more stressful than a plumbing services emergency? Imagine returning home from a day at the beach to find water covering the floors inside your home, or a toilet overflowing? Plumbing services emergencies have a way of occurring at the most inopportune times, and usually invoke the panicked feeling that accompanies the anxiety of helplessness. When that happens, the most important call you can make is to Cape Shore Plumbing, SWFL’s 24 hour emergency plumbing services, to resolve all your household plumbing emergencies and restore your peace of mind. Whether you need help with toilets overflowing, clogged drains, sump pump or sewer cleaning, leaking pipes, leaking faucets due to rusting and corrosion, or water heater malfunctions, our emergency plumbers will provide the solution that is right for you while restoring order to your home. No matter how large or how small the problem, Cape Shore Plumbing’s 24 hour emergency plumbing service offers speed and precision in making your repairs and backs them with guarantees. 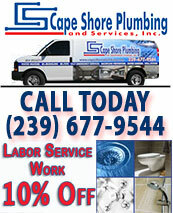 Cape Shore Plumbing's 24 Hour Emergency Plumbing Professionals Repair Overflowing Toilets, Clean Drains, Repair Pipes and Resolve All Your Other Emergency Plumbing Needs with Skill, Expert Workmanship, and Respect for Your Home. When you rely on SWFL’s 24 7 plumbing team, you can rest assured knowing that you have chosen SWFL’s premier local plumbing experts to resolve your plumbing services emergency. Our emergency plumbers thoroughly inspect and fix your problem correctly the first time using only quality supplies and expert workmanship. Our work is accompanied with with hassle-free guarantees and the restoration of order to your home or business. 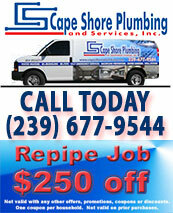 When you are faced with a plumbing services emergency, Cape Shore Plumbing's 24 7 plumbing response team stands at the ready. By calling SWFL emergency plumbing service experts, you can rest assured that any plumbing services emergency will be resolved with speed, precision and backed by guarantees designed to provide you with peace of mind. 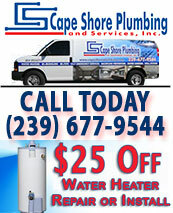 No matter what time of day or night you require emergency plumbers services, do not hesitate to call Cape Shore Plumbing, your 24 hour emergency plumbing contractor, at (239) 677-9544. We don’t sleep so that you can.